On Saturday, July 9th, three puppies starving in an abandoned house in Northampton County, NC were transported to safety in Middletown, DE by Doobert.com volunteers. 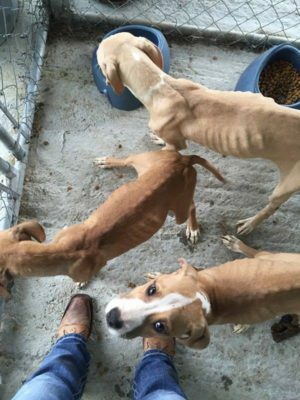 Northampton County Animal Control found the emaciated puppies in an abandoned house. The past owners of the house received warrants for the mistreatment of the puppies. It Takes a Village Animal Rescue and Rainbow Animal Rescue of North Carolina came together to care for the pups until they could be transported to their new rescue. With the help of the community, they received enough donations to care for the unhealthy puppies and prepare them for their trip. Rusty Miller and Terri Allen, volunteers of Liberty Ride Transport, coordinated the journey for the pups up to Middletown, DE.